A daughter of Stadtholder Frederik Hendrik and his wife Amalia von Solms-Braunfels, Albertine Agnes was the first member of the Oranje-Nassau dynasty to marry into the family of Nassau-Dietz. 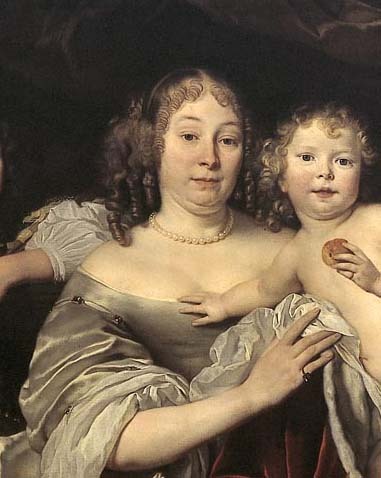 Following the death of her husband, the Frisian Stadtholder Willem Frederik (1613–1664), and until the coming-of-age of her son Hendrik Casimir II (1657–1696), Albertine Agnes became the first female ruler to assume the stadtholdership as regent, and her extensive correspondence throughout this period is testament to her work in this role. Albertine’s son Hendrik Casimir suffered from poor health. He was also short-tempered and, as a consequence, lacked diplomatic skills. Albertine, who was acutely aware of her son’s failings, continued to make frequent interventions on his behalf. The continuous rivalry between Hendrik Casimir and his cousin Stadtholder-King Willem III caused strained internal relations within the House of Nassau, something which Albertine, in her role as mediator, also worked to improve. Albertine Agnes was widely known as the patron — a Maecenas — of a number of large architectural projects, as well as a passionate collector of paintings and objects d’art. The metadata for this catalogue in EMLO was provided by the Huygens ING under the direction of researcher Dr Ineke Huysman. 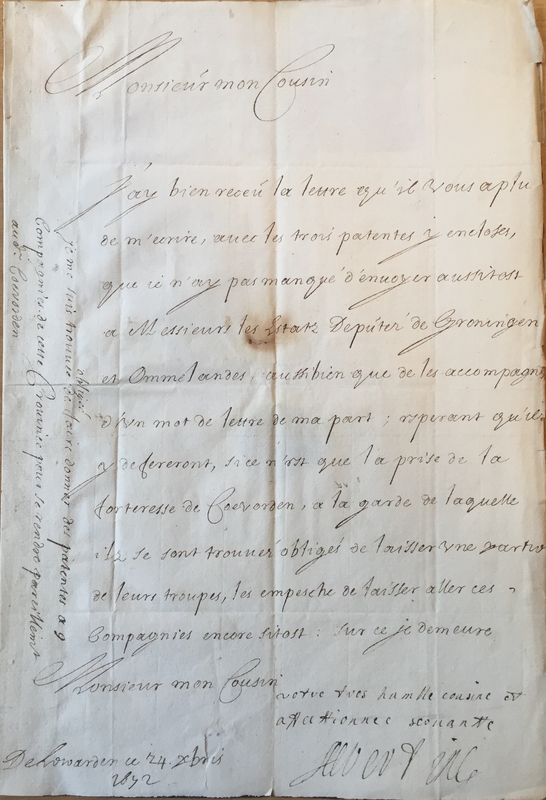 Huygens ING has digitized 423 documents in cooperation with the Royal Collections The Netherlands in The Hague, where most of the original letters are conserved (Archief Albertine Agnes van Oranje-Nassau, A25a and Archief Johan Maurits van Nassau-Siegen A04-1476k). Recently, in collaboration with the Fryske Akademy, metadata of 386 letters both from and to Albertine Agnes, which are conserved at Tresoar in Leeuwarden, have been added with the assistance of Bettina Heyder. As a master’s student of Art History at the University of Nijmegen, Bettina performed an internship at the Fryske Akademy under the direction of Dr Hans Cools. This calendar has been prepared for publication as part of a collaboration with EMLO and the associated Women’s Early Modern Letters Online [WEMLO] resource. Thanks are due to Professor James Daybell and Dr Kim McLean-Fiander, and to Dr Nadine Akkerman. Cultures of Knowledge would like to thank EMLO Digital Fellows Charlotte Marique and Callum Seddon for their work to help prepare the metadata for upload. Currently the catalogue contains metadata for a total of 782 letters, comprising letters conserved at the Royal Collections [Koninklijke Verzamelingen] in The Hague and at Tresoar in Leeuwarden, and one letter from a private collection. The letters, which date from 1651 to 1695, are written in German, French, and Dutch. Albertine Agnes was the author of 127 of these letters, whilst 609 are addressed to her. In Albertine Agnes’s archive at Tresoar, fifty-five letters were found in which she was neither the correspondent nor the recipient, but was only the subject of writing; these have been included in this catalogue. Of the letters conserved at Koninklijke Verzamelingen, each letter record has a link to a digitized copy of the original document. At present, for the correspondence of Albertine Agnes conserved at Tresoar in Leeuwarden only the metadata are available but digitized images of these manuscripts will be added in the near future. A. M. Backer, Er stond een vrouw in de tuin. Over de rol van vrouwen in het Nederlandse landschap (Rotterdam, 2016). M. Bruggeman and A. P. van Nienes, eds, Archieven van de Friese stadhouders. Inventarissen van de archieven van de Friese stadhouders van Willem Lodewijk tot en met Willem V, 1584–1795 (Hilversum, 2002). S. Groenveld, ‘Nassau contra Oranje in de 17de eeuwse Republiek’, Jaarboek Oranje-Nassau Museum (1997), pp. 11–53. A. A. Kleijn, De stadhouders van Friesland uit het Huis van Nassau (Nijkerk, 1904). G. H. Janssen, Creaturen van macht. Patronage bij Willem Frederik van Nassau (1613–1664) (Amsterdam, 2005). R. Mulder-Radetzky, ‘Huizen van Albertine Agnes’, in S. Groenveld, J. J. Huizinga, and Y. B. Kuiper, eds, Nassau uit de schaduw van Oranje (Franeker, 2003), pp. 99–112. Johanna Naber and L. de Neve, De vorstinnen van het Huis van Oranje-Nassau (Haarlem, 1898). F. Storto, Oranienstein. Barockschloss an der Lahn (Koblenz, 1994). J. Visser, ‘De Friese stadhouders, De Witt en de Unie’, in J. J. Kalma and K. de Vries, eds, Friesland in het rampjaar 1672. It jier fan de miste kânsen (Leeuwarden, 1972), pp. 73–91. J. Visser, ed., Gloria Parendi, Dagboeken van Willem Frederik, stadhouder van Friesland, Groningen en Drenthe, 1643–1649, 1651–1654 (The Hague, 1995).